Unscrew the battery door. Install one "g13" (or equivalent) battery into the battery compartment. Close the battery door. Replace new battery when the low battery indicator appears on the display. Press the "on/off" button. All functions will show on the display. The thermometer is ready for use. Press the "low al" or "hi al" button for setting alarm at desired low and hightemperature. The digit flashes. The display will show -50°C or -58°F and start to increase up to +150°C or +302°F / +299°C or +572°F. Release the "low al" or "hi al" alarm set button when the desired temperatureis approached. Press the "low al" button, the "low" sign appears on the left bottom corner. Press the "hi al" button, the "high" sign will be shown. The display value will stop increasing. After releasing the button for approximately 3 seconds the thermometer will return to the normal mode. 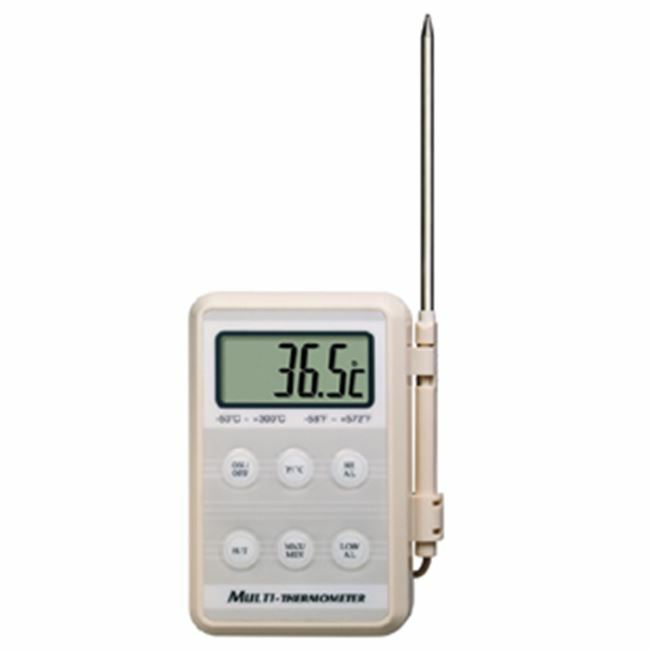 The alarm will sound 4 beeps per minute when the measured temperature equals or is greater than the maximum or less than the minimum set value. Alarm off: to delete the alarm set, press "°F/°C" button. To obtain the best results. The probe tip should be immersed at least 10mm. Into the tested substance. The thermometer cannot be used or put inside any oven or microwave. Θερμόμετρο ψηφιακό φορητό με ατσάλινη ακίδα και καλώδιο ενός μέτρου. Κατάλληλο για εργαστηριακή και ημιεπαγγελματική χρήση. Ιδανικό εργαλείο για επιθεωρήσεις, HACCP, έλεγχο ποιότητας, παρουσιάσεις, επιδείξεις κλπ. Δύναται να πιστοποιηθεί.